Cars are changing – robots are arriving. The trend to taking seriously the history of the automobile is recent. It is something of a case study in the development of heritage, and it has got me thinking. Here is a standard definition of heritage – buildings, objects, traditions, landscapes that are considered of cultural value and worthy of protection for the future. The heritage industry took off in the 1970s. Visiting old places and experiencing the remains of the past in the present have become key components of the world’s biggest economic sector – tourism. Heritage is treated by the likes of UNESCO as a human right – people have a right to a past. And governments regulate what people do with old buildings, sites and objects through protective legislation. In my entry in the Oxford Companion to Law (see below), I connect heritage with cultural property. And certainly we can see how some cars are coming to carry cultural values – they’re not just personal property. Many, we might even argue, have always transcended their simple function or use value. Its not just that people buy cars to say something about themselves, but that the cars themselves embody certain values, or the spirit of their times. Was a Mini ever just a means to get from A to B? And heritage is often the subject of quite considerable dispute. The Greek government persists in its claim that the marble sculptures taken from the Parthenon in Athens at the beginning of the nineteenth century, and now in London’s British Museum, should be returned. There’s even a new museum for them by the acropolis – empty and waiting. Why? Because the marbles are held to represent the essence of Classical Greek cultural achievement – and this deserves to reside where it originated, so such argument goes. We’ve also been witnessing the strong reactions to the way certain Islamic groups, the Taliban and Islamic State, have destroyed ancient artifacts – the Bamiyan Buddhas [Link] [Link], statues in the museum at Mosul [Link], the ancient Assyrian site of Nimrud [Link]. That heritage gets caught up in disagreement and conflict shouldn’t surprise us, of course, because people deeply associate sites and objects, their history and presence, with what makes you who you are – vital components of identity. Protecting or destroying the past can be a very powerful commitment or statement. So the importance of the past in the present to the future is about more than sites and objects. Official definitions of heritage have for a while now included intangible artifacts, such as traditions, stories, rituals, even values. So heritage is much more dynamic a notion that involves how and why we connect with the past-in-the-present, dynamic relationships between past and present. Our symposium in the Revs Institute flagged up legacy as a key focus. The concept of legacy invites reflection on how we connect with what’s left over from the past, what has come down to us, by whatever means. Do we welcome a particular legacy? Do we think it right and proper to protect and pass on a certain legacy? This takes us into some of the dynamics of heritage. Mike Pearson and I have gone further in defining these issues as being fundamentally to do with the performance of the past in the present. We defined our notion of theatre/archaeology as “the re-articulation of fragments of the past as real-time event” [Link]. We want to shift the emphasis in heritage from property, rights, responsibilities, values, to the ways we might take up the remains of the past in the present. One of my talks at the symposium was “We’re all archaeologists now – working on what remains” [Link]. My point is to have us focus on the work done on the past, with the past. The background is a long-established principle in Science Studies that science is better understood as a means of building knowledge, rather than a body of knowledge, theories, findings. So, in my book Experiencing the Past (1992) [Link] I showed how archaeology was a means of crafting the past-in-the-present. Archaeology is a mode of production of value. Heritage is well understood as a mode of production of value. I love the way this throws emphasis upon what we do with old cars – how to maintain them, how to keep them running, how to conserve and restore. Mike and I are preparing a new edition of Theatre/Archaeology (it came out in 2001 – [Link]). We’re now describing performance as a field of design – [Link]. The broad point concerns the importance of memory and the past to human making and design – how things can remind us of the past, how time, tradition, history, memory can be mobilized to deliver value. Architecture is all about negotiating a place in history – one building may draw upon the past, another may reject it. Referring to history and past associations can help to orient a product or device, and so add to its value. We do well to remember this importance of the past in a world today that seems so oriented upon the future. I have found that most designers now are enthusiastic design historians; historical connections and roots bring significance and meaning to a product. Some companies are embracing the past to enhance their own corporate identity. 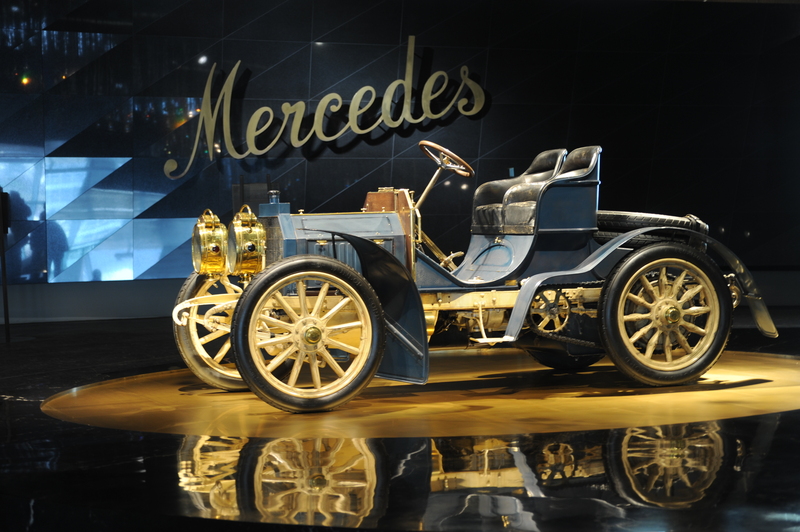 Mercedes Classic, a subsidiary company of the car manufacturer, is centered upon a remarkable museum that tells the story of the automobile, invented by a founder of the parent company. In the last few years it has invested 500 million Euros in spare parts for old Mercedes cars. Anyone with a classic Mercedes can be confident that they will be able to maintain their cars for the foreseeable future. Mercedes is using the past, and the presence of the past with us here and for the future, to assure us that they’re here to stay, that the company and its cars are a part of history. As a Mercedes owner, you can share this. This is quite a value proposition. Consider also the concept of path dependency — how decisions made in the past determine what is possible now. For example, any electrical device today must be compatible with the decades old 110/220 AC voltage standard unless it comes with an independent power supply. This is path dependency. Another example is that new software operating systems, like Microsoft Windows, need to be compatible with a host of software and devices that were sometimes designed long ago. There’s a big message here. You can never wipe the slate clean and start completely fresh, because the past is all around us and makes us who we are. Innovation and change are always rooted in the past; after all, that’s what we have to start with. Think of your own personal memories and associations — the way childhood experiences and memories continue to shape our thinking and emotion; they can come back to haunt us, or inspire us. They condition the way we think of ourselves and plan for the future. What might we call this diverse field of working upon what remains? I suggest pragmatology. Pragmatology: the theory and practice of “pragmata”. Encompassing the richness of the old Greek meaning of the term, pragmata are “things”, but also, “deeds”, “acts” (things done), “doings”, “circumstances” (encounters), “contested matters”, “duties”, or “obligations”. The verb at the root of pragmata is prattein, to act in the material world, engaged with things. This is cognate with making as poetics (the Greek root is poiein) — a creative component to practice generally. Here I emphasize the care archaeologists, heritage managers, and many others have for pasts-in-the-present, a loyalty to ta archaia (a root of “archaeology”), literally translated as “old things”. Remnants, vestiges, monuments, artifacts hold memories which we attentively piece together with, typically, an aspiration to fidelity and authenticity. Of course, archaia demand a particular orientation, both practical and imaginative. To regard old things of archaeological and heritage interest as pragmata reminds us of the primacy of engaging with things, that many others are drawn to these matters in different ways, in different (performed) engagements or encounters, and so may even constitute them as different things, because pragmata do not stand on their own — they become what they are through our relationships with them. This constitutive importance of particular engagements with the past, as the past comes to be what it is through our actions upon it, means that there is no definitive end to the past. The past lives on in our relationships with what remains, and so there is always more to be said and done. The challenge is to meet things, the past, halfway, in our future-oriented archaeological projects to make something of what remains. I have commented that performance is project design — scenographically and dramaturgically assembling and arranging agents, props, architectures, and events, in relation to scripts, precedents, styles, ideologies, sets of skills and techniques, and with regard to intention, affect and effect. My term “pragmatology” includes such design processes. Working on what remains: this is a field of design. I return to the question I just raised: What form should heritage practices take? An answer is: design practice. A detailed exposition of design practice is not really necessary here, because the way I have described archaeology and performance, with an emphasis upon process, is in fact as design pragmatics. I am just calling them what they are. Nevertheless I offer a few comments as summary and to point to connections so fertile they offer considerable potential for addressing the concerns of heritage management. In the Hasso Plattner Institute of Design, where I sometimes teach, we pursue ‘design thinking’ (Tim Brown 2009, Change by design). This is our shorthand for a distillation of human-centered design, that approach to industrial and product design that began in the 1960s to give less priority to styling (the look of a product) and more to the way artifacts relate to people’s physiological needs, experiences, emotions, dreams and desires—interaction and experience design. It is well described as a pragmatics, and in architecture and product design this is highly professional and refined, having close connections, as I have tried to show, with contemporary arts practice. to establish deep, empathic insight into needs and desires of clients, constituencies, and communities. Define the problem/need/desire, or else redefine — building a museum may not be the solution to users’ needs and points of view. Make this definition design actionable, something that can be addressed by a service, a product, an experience, something made or assembled. Ideate: generate ideas and possible solutions to the challenge/brief — perhaps enhanced support for a car-and-coffee societies may be just what is needed. Choose some of these ideas for prototyping: material models/mock-ups that can be shared, showing possible solutions, not specifying a definitive answer. Show, rather than tell. Share these models, test them out with people to see how they work, or not — evaluate. Perhaps it emerges that what really is at stake is demographic in character — a disjunction between the attitudes to the past of younger and older generations. Repeat/iterate with another prototype. Build when force of circumstance dictates (depending on feasibility of technology and resources, practical and economic viability). Be aware that any ‘solution’ is provisional. In all of this process there is rich and flexible interplay between action, inscription and description, research and theory, fabrication and display, with agents, witnesses and audiences, experts and users constantly exchanging roles in collaborative co-creating teams or communities that recognize little hierarchical structure. Such design thinking ￼connects with what I have outlined as agile management (Shanks 2007). This pragmatics is about informed intervention under a tactical attitude, performative remix and assemblage, post-disciplinary, because it freely can combine scientific research and expressive arts, and located in specific encounters between past and present. There is both ambition to make a difference and contribute to well-being, as well as a humility that stands by work done while recognizing how provisional that work always is. This term refers to artifacts considered to be of significant cultural or historical value. Typically these are monuments, archives, archaeological finds and sites, works of art and craft, and items of ethnological interest. Their value is related to claims that they have a special connection with a community, such as a nation or ethnic group, that they are integral to the identity of such a group, and that they provide significant information about a group or about humanity. ‘Cultural heritage’, and its close cognate ‘patrimony’, are collective terms for such objects and sites. For example, an ancient Mayan sculpture may variously be valued as cultural property because Mayan civilization is claimed as ancestral precursor to some contemporary communities in central America, because it is part of a history of human artistic achievement and can thereby command a significant price in the art market, because academics study the artifact as evidence of the history and workings of Mayan society, or because such items are collected by museums. There is disagreement over how old objects and sites need to be to qualify as cultural property. The terms ‘cultural property’ and ‘cultural heritage’ also include and frequently refer to intangible artifacts such as historical events and narratives, myths and legends. Nor is the definition of what particularly constitutes cultural property at all static; the field of cultural heritage is characteristically one of competing claims to significance, value and ownership. For example, a Mayan sculpture legally acquired by a European museum and held in their collections may become subject to a claim of ownership by a community or state in central America, with demands for the repatriation of the work to its claimed place origin or indigenous home. The most significant recent international instruments dealing with cultural property are the 1970 UNESCO Convention on the Means of Prohibiting and Preventing the Illicit Import, Export and Transfer of Ownership of Cultural Property, which has 100 signatory nations, and the 1972 Convention Concerning the Protection of the World Cultural and Natural Heritage. • protective and regulatory legislation dealing with imports and exports of cultural property. • ownership of cultural property — can anyone own the past? • sovereignty — is there a place for state involvement and ownership? • is collective ownership of cultural property defensible? • stakeholder interests — who can claim ownership and on what grounds? • cultural identity — how is identity connected with cultural property? • (professional) ethics and responsibilities — how should museums deal with claims for repatriation or with the art market? • identity — where the property is claimed to be part of cultural, religious or other identity. • origin — the item is argued to belong where it was made or comes from. • ownership — the item is claimed as legal property. • curation — in the absence of any other care, possession is claimed by those who have looked after an item. • academic expertise — a party may claim an item on the basis that they can make the most of its educational value to inform people of their heritage. • that it is right and responsible to maximize the retention and transmission of information about the past and about culture. The difficulty in achieving settlement of competing claims to cultural property on the basis of clear definition and regulation of such rights, responsibilities, interests and arguments has led to the treatment of cultural property in terms of conflict resolution, with a focus not upon a specific kind of artifact or property but upon diverse local relationships with the remains of the past that beg negotiation around shared human values, such as the significance of the past for the present.